- Small wheel holder attachment. Made from billet Aluminum, NOT powder coated steel that will chip and rust! 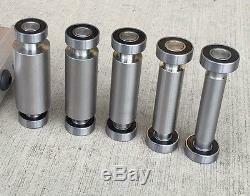 5 piece cold rolled 1018 steel small wheel roller set. I will update the picture soon. 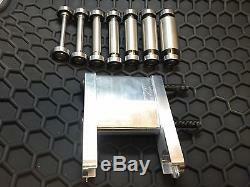 (set includes 1/2", 5/8", 3/4", 7/8", 1). 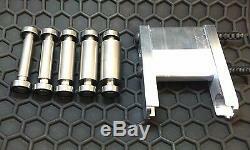 The wheel shafts and the small wheel holder are made in the USA out of USA Materials. 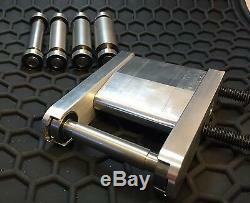 The bearings are globally sourced but I have found them to be a great combination of price and quality. These small wheel are made to work with 2 wide belts and under.